★★★★★ Wow, I don't often write reviews but I was so impressed with this brush. Great quality tapered brush. And not only was it delivered quickly, they also included a pouch for the brush and a "brush egg", which I had never heard of, but is a silicone egg with ridges for cleaning brushes. It's not very often that you get more than you paid for, but I definitely appreciate it when it happens. Would HIGHLY recommend. ★★★★★ OMG!!!!!!!! I ordered these brushes a few weeks ago and I wanted to test them out before I gave a review. I am in LOVE with these brushes. They are so soft, they feel so luxurious and high end. Like even the weight to them feels so nice and high end. I found a similar brush set from sigma for over 200 dollars, so I decided to take a chance on this, and I am so glad I did. I recommend you order these if you are looking at them. The price is SO right, and the quality is so much more than you pay for. Its practically a steal. Like others said it had a scent when they first arrived, but it just smelt like new products and like it had been kept in storage or something. It aired out fast. I have already washed these brushes twice, and each time I swear they are getting softer. I haven't experienced any shedding, and I even got a free cleaning egg thing in my package. My brush collection now sits on the top of my makeup storage containters, in these glitter jars I made specifically for these beautiful brushes. I can't say enough good things about them. Just order them guys, I promise you will not regret it. I don't know how I managed to blend and set so perfectly before these came into my life, and I never want to know that life again lol. ★★★★★ Great kit for beginners. I was just starting to get into makeup and wasn't sure what brushes I would want, so this set was perfect. I only use about half of them, but as I learn more techniques I'll probably use more of them. The brushes are soft and seem high quality. And I love that they have their own bag. ★★★★★ I ordered this make up brush set as an addition/replacement to my Sephora and Make Up For Ever brushes (some in value up to $50). I was told by my doctor to replace all my make up and brushes because of my skin condition. So I wasn't going to spend another couple hundred dollars to replace each brush individually after all I wasn't completely satisfied with all the brushes I have. 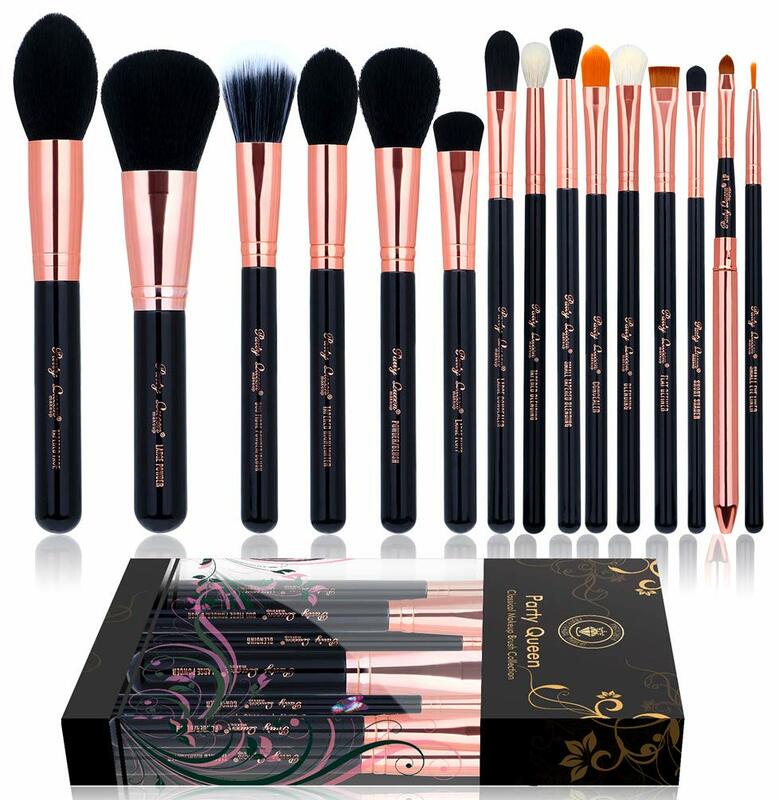 So I was looking for sets and came across this beautiful rose gold set and saw that it had been compared to brands like Sigma and that artists were actually ordering this set for their kits. So after watching many reviews I ordered the 15 piece set, the 12 piece Professional Set, and the 10 Piece Kabuki Set. I couldn't be more pleased! The brushes are softer than their Sephora counterparts actually! The brushes that are suppose to be tighter are tighter than (which is better for precise application on some types of brushes) my Sephora brushes. There were only a few that I didn't like out of the kits. I will list each brush and say what I liked or didn't about it.Duo Fibre: Great for applying a light amount of bronzer to the edges of the face, such as the temples and jawline.Large Powder: I love this brush for setting powder.Large Angled Contour: This is a great blush brush.Foundation: This is a way better foundation brush than my Sephora #47 brush. I was amazed at how well this worked. I used this for my Tarte Primer (the one in the glass container) and my foundation! LOVE IT!!! !Tapered Blending: Lovely transition shade brush or highlighter brush.Large Shader: Good for brow bone colors.Concealer: Great for under eye concealing.Medium Angled Shading: Nice for nose contouring or outer corners of eyes.Eye Shading: Use for eyeshadow primer or base color.Pencil: Nice for lining the eye with shadow or cream shadow.Small Angle: I love this brush for a precise eyebrow brush!Eye Liner: I love this eyeliner brush prefect for winged eyeliner!Overall this is a great kit with everything someone starting off would need to apply their make up correctly. I would recommend their sponges for seamless foundation coverage. I also got a free silicon brush cleaner in the leatherette bag which is awesome! Thank you Party Queen. ★★★★★ I love these brushes! will definitely buy again they are worth every penny and if you don't buy from this seller you will be missing out on a very good deal thank you thank you so much!